If you are interested in being a vendor at Weare's Old Home Day, Click here. The first Old Home Day did not take place until August 29, 1900. During the last half of the 19th century the town's population had dwindled. The combined effect of the first textile mill in Manchester (1810), the building of the Amoskeag Dam (1837), and the coming of the railroad to town (1850), which brought everything from grain to textiles, was a movement of families toward easier farming in the west and individuals to cities to work in large mills powered by vast sources of water power. The first Old Home Day in 1900 turned out to be a very special day. People packed a seven-car train that ran from Manchester to Weare for the sole purpose of "going home." Featured that day were a morning parade, a basket lunch, and other activities, including music by Weare's own Cornet Band and Derry's orchestra of Hopkinton. 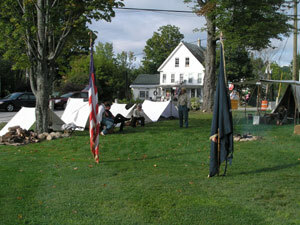 The second Old Home Day was celebrated in 1901 with over 1200 people in attendance. The morning parade included an old stagecoach, hayracks, decorated bicycles, and "funny men," along with the usual assortment of animals. Again, there was a basket lunch and the Cornet Band played under the leadership of Loren Clement (his namesake and great great grandson is Weare Historical Society's current vice president). Thirty-three years later, in 1934, the third Old Home Day was held. The usual festivities took place with music provided by the Weare Band. A ball game and an evening dance were added to the day's entertainment. The predominant parade entry of the fourth Old Home Day, held in August 1948, was a number of decorated automobiles, which included a 1911 Model 1 Ford, open-passenger car owned by the South Weare Garage, the first Ford dealership in New Hampshire; this dealership was chartered by Henry Ford himself, who visited Weare on more than one occasion. The state's representative to Congress, Norris Cotton, was the principal speaker. A Mrs. William Lafond was honored at the parade as the mother of five sons currently serving their country in the armed forces. In the twenty-first century, interest in reviving the Old Home Day tradition was ignited when the Episcopal Church held a Family Fun Day at Weare Center. They filled the school side of East Street with tons of crafts and games for kids and adults and topped it off with a chicken barbeque at the Weare Town Hall. Weare Historical Society joined in and held an open house at the Stone Memorial Building museum along with, one year, Berdan's Sharpshooters, a Civil War re-enactment that included camping and marching down East Street to the cemetery where two of the original Weare sharpshooters are buried. By 2005, it was decided to have a Family Fun Day with an Old Home Day theme. In 2006, the last Saturday of August was designated as Old Home Day. 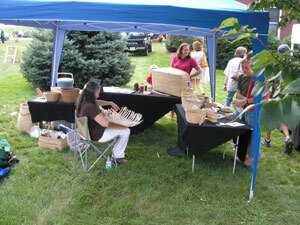 Weare Historical Society began to enlist other organizations and serve as host of the event. The Friends of the Library, Lions Club, American Legion Post #65, South Weare Improvement Society, the Farmers Market, Weare School Board, Safe Routes to School Task Force, the Village Chapel Baptist Church were among the early groups. Since then the Weare High School reunion for graduates 50+ years ago moved their gathering to Old Home Day and now congregate at the new Middle School in Weare Center. Highlights of the events over these past years, besides all of the artisans who have explained their process and displayed their work, include honoring WWII veterans who sat in the rotunda of the Stone Memorial Building to discuss their service, a book signing for Weare Historical Society's history of the village schools, Mr. and Mrs. Lincoln re-enactors who provided a glimpse of history in the making, the Civil War's Berdan's Sharpshooters who twice came to set up camp for the weekend on the Stone Building lawn and march down East Street on Sunday, and children participating in old fashioned games. In 2008, the Back Porch Group broadcast their old-time music from the gazebo. In 2009, three bands will provide daylong entertainment. *Source of information about the first four Old Home Days and effects of the Industrial Revolution, Town History of Weare from 1888 by Helen E. Dearborn, Weare, NH, 1959.